David's Road to Recovery - CARITAS - Shelter. Jobs. Recovery. Hope. David remembers taking his first drink. He was 10 or 11. He reached into his father’s liquor cabinet and gave it try. After that, he didn’t touch alcohol again until he was 14. He didn’t know then, but his father was an alcoholic. After his family moved to Pennsylvania, David earned a spot on the varsity baseball team at 14. He was a good student and hung with the popular crowd. Here, he was introduced to marijuana. He enjoyed the drug, but not as much as alcohol. He eventually began stealing alcohol from his father, who never noticed. He was the life of the party, supplying his friends with the fun. Substance use disorder slowly took hold of David. Like many, he didn’t see it coming. Neither did his friends or family. He moved to Florida after college with a girlfriend. Away from his support system, his disorder intensified. After two years in Florida, his brother called with bad news: his father was dying. After that, David swore off alcohol. That was the first time of many. A decades-long battle followed. A crumbling relationship, easy access to prescriptions at work, and endless reasons to party compelled David to relapse again and again, each time worse than the last. After four DUIs, unsuccessful short-term treatment programs, and three alcohol-related visits to the hospital, David had hit rock bottom. On his way home from the final hospital visit, he visited a liquor store. A friend from his recovery network came over. 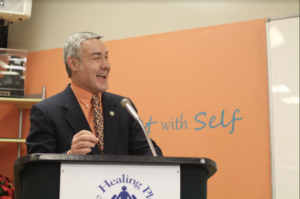 At The Healing Place, David was able to “get away from the pressures of life” and focus on his substance use disorder. David progressed through the phases of The Healing Place program quickly. As his time in the program ended, David accepted an opportunity to enter the CARITAS Works program. In the CARITAS Works classroom, he found himself helping other students learn computer skill and more. David then became a become a Peer Mentor in The Healing Place. As a Peer Mentor, David helped other men like him who were working their way through the program, addressing their past trauma, and making plans for the future. While a Peer Mentor, David pursued and earned his certification as a Peer Recovery Specialist. After graduating from Works, David became an AmeriCorps service member and joined the CARITAS Works staff. David has used the AmeriCorps tuition reimbursement program to finish his Bachelor’s degree. His final day on the CARITAS team is August 4, 2018, two years after he had his last drink. David will graduate from Shenandoah University with a Bachelor’s Degree in December. He only has two classes left. David says he’s not sure what he’ll pursue after he completes his degree. What he does know, is that he’ll keep giving back.